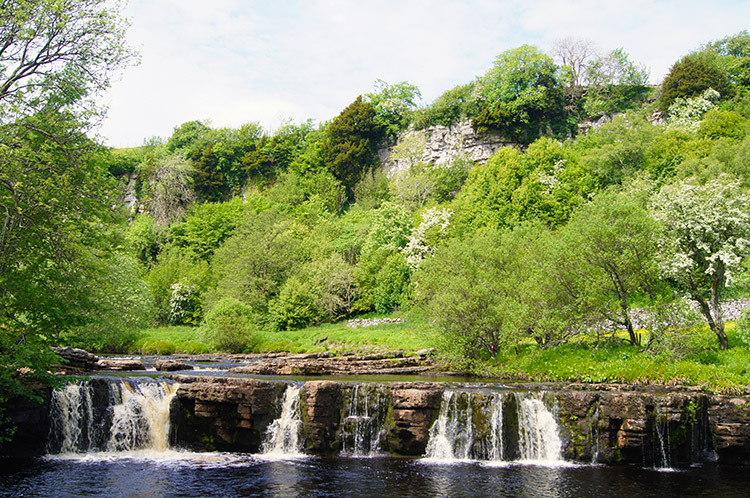 Summary: This walk is categorised as easy but it is not to be underestimated as getting close to some of the waterfalls, particularly Kisdon Force requires care and effort. 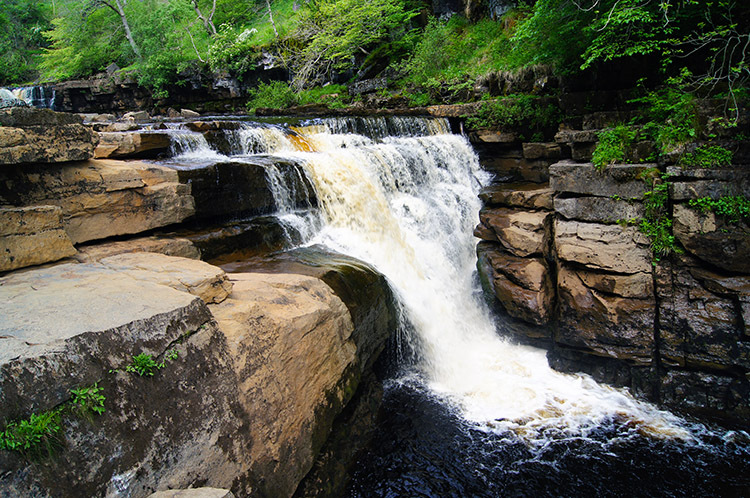 The rewards for the work are super views and experiences of some of the best waterfalls of the River Swale and its upper tributaries. There is also a lovely upland walk with excellent views to enjoy too. The Walk: I was at a loss what to do. It was Sunday morning and as Lil and I enjoyed breakfast we talked over what we should do for the day. We had nothing planned and morning had broken without a cloud in the sky. It was the 1st of June, we just had to go out for a walk but where. I ran upstairs and picked out a book 'Historic Walks in North Yorkshire'. Perhaps a short walk centered around a Stately Home or heritage site? 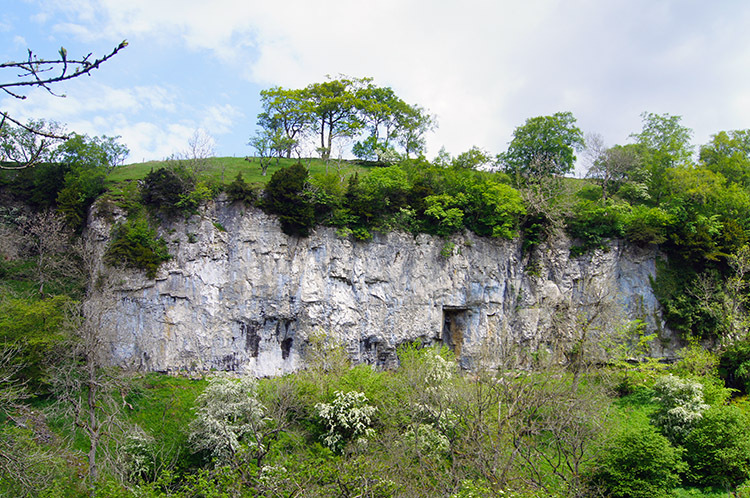 There were walks of that ilk in the book including Bolton Abbey, Fountain's Abbey, Aldborough Roman Town, Richmond Castle, Nunnington Hall and Castle Howard. However, amongst all these possibilities one place conceived an idea. It was Crackpot Hall and while I could have taken Lil there I knew how much she loved waterfalls. This walk was born at that moment. Without telling Lil the destination she set off driving us from home towards Leyburn with the promise of what I phrased "a short walk to beautiful places". I added "and after the walk we can have afternoon tea out". She was pleased with that. After Leyburn I had to give more information away so I told her to head over the moors to Swaledale and to continue on to Keld. I directed her on the roads to take as a rally drivers navigator would. Not that we were going at any pace. Sunday traffic in the Dales is heavy enough to slow passage these days. Gypsy Caravans travelling to the Appleby Horse Fair made the slow drive a crawl in parts but we were not rushed. Some clouds had built over the northern dales and we were happy for them to pass as we continued on into Swaledale. And they did for us. 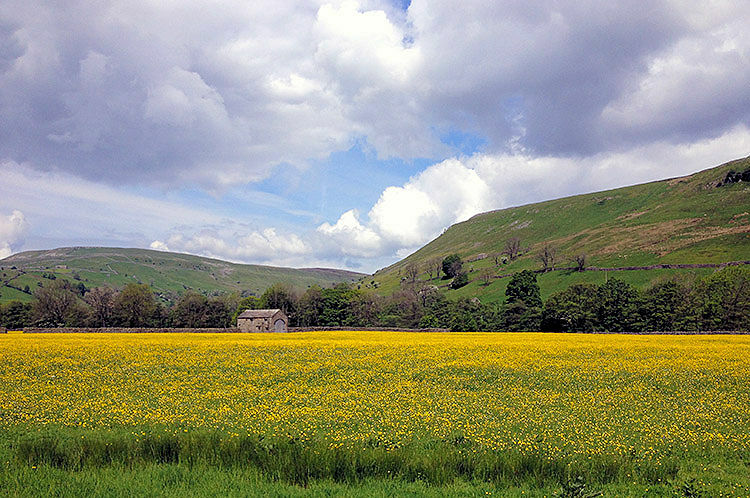 As we dropped over the tops into Muker the sun came out again and provided us with a beautiful colourful picture of lush Swaledale meadows swathed in yellow buttercups. Soon after we had made our way up the valley through Muker, Thwaite and Angram to reach Keld. We found a parking space in the village centre. From the village we walked down the lane south eastwards to reach the river at the footbridge near East Gill. I beckoned Lil to cross and wait on the seats by East Gill Waterfall while I took the erratic and narrow up and down path to Kisdon Force. I told her I would be 15-30 minutes. 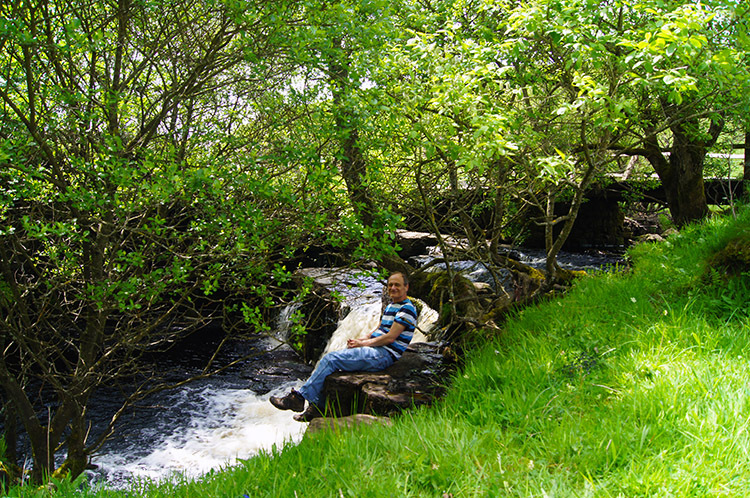 She was happy to wait for me and chill out by East Gill Waterfall while I did the hard bit of the walk. I descended from the path sticking close to the cliffs of Birk Hill to meet a point where a steep fork left provided a way down to the waters edge. The path went on towards Muker but I did not follow it, for me it was now a case of getting down the steep and wet path to see Kisdon Force. Fortunately a rope had been attached to a tree to help me get down safely. And the rope was knotted to arrest any slip of the hands. I carefully negotiated my way down and without slipping on the water trickling down the path. Safely and surely I strode onto rocks beside the river and feasted my eyes. 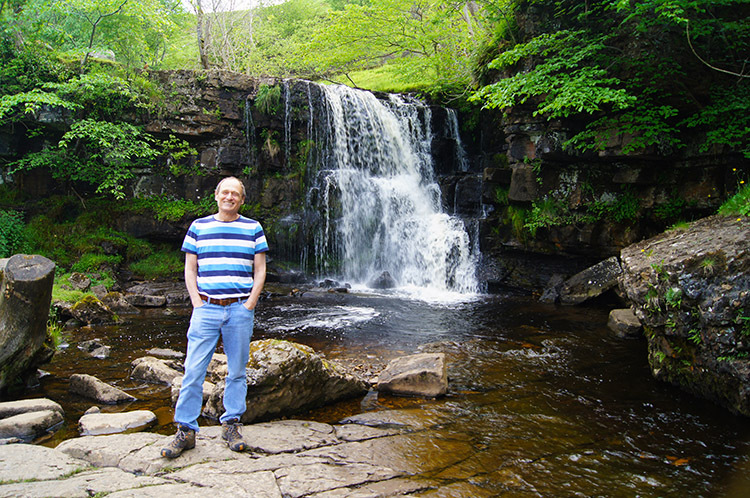 I was close to Kisdon Force, a series of two waterfalls about 50 metres apart. 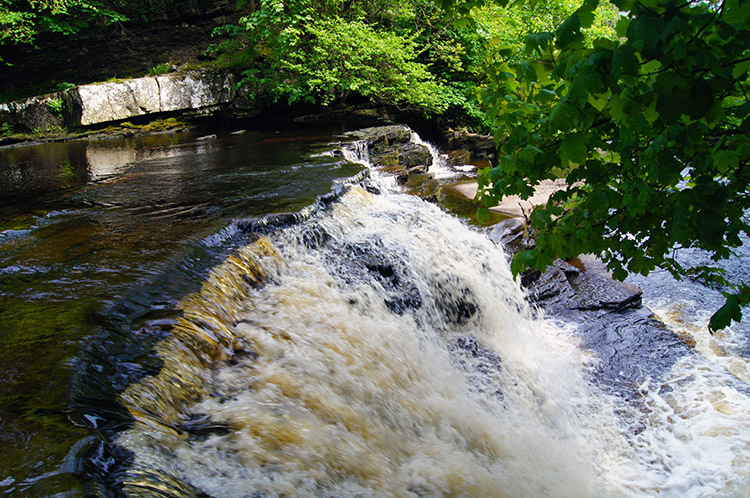 The upper falls spilled over a wide flat rock platform into the huge plunge pool I was stood beside. I gazed in awe at the waterfall and also to the blue hued cliffs above. It was superb. 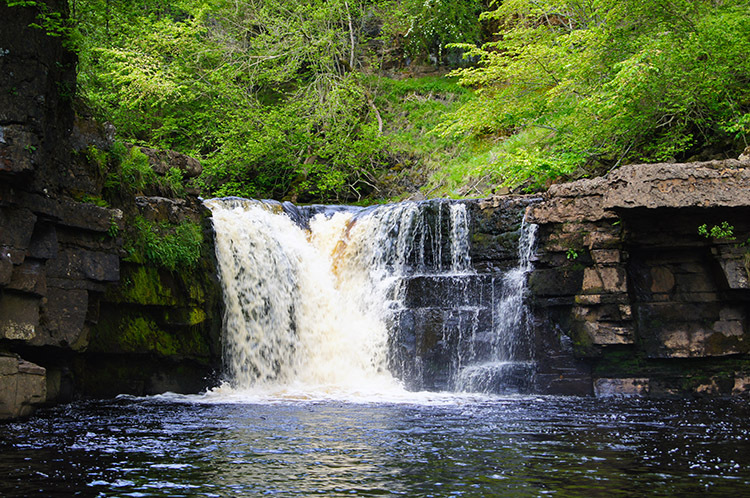 I edged myself carefully downstream over rocks beside the river to get close to the lower of the two waterfalls which comprise Kisdon Force. This one had a slightly longer drop and while the upper waterfall is practically symmetrical with an unbroken plunge into a vast pool the lower waterfall is challenged by rocks restricting its fall on the north far) side of the river. I looked over the lower falls to the upper falls, all captured in one majestic view. could have stayed for ages but I had to get back to Lil. I left with a pang of angst and climbed the bank by gripping the rope tightly. I made it safely up, rounded Birk Hill one more and followed the narrow undulating path back to the footbridge. I crossed it to meet Lil. She was happy, full of contentment sat on the bank. "How have you been" I asked. "Watching the stirrings" she replied and added how she had watched a Ewe leading its lamb down to the gill for a drink. And how she had watched the birds enjoying the spring day while people just sat and relaxed. I said "Good, let's move on shall we?". From East Gill we followed the Pennine Bridleway footpath up to East Stonesdale and then continued on the path which provided us with breathtaking views of Upper Swaledale. The views upstream to Birk Dale and downstream towards Thwaite and Muker were equally appealing. Buttercups shimmered everywhere in the sunshine giving the fields extra attraction. 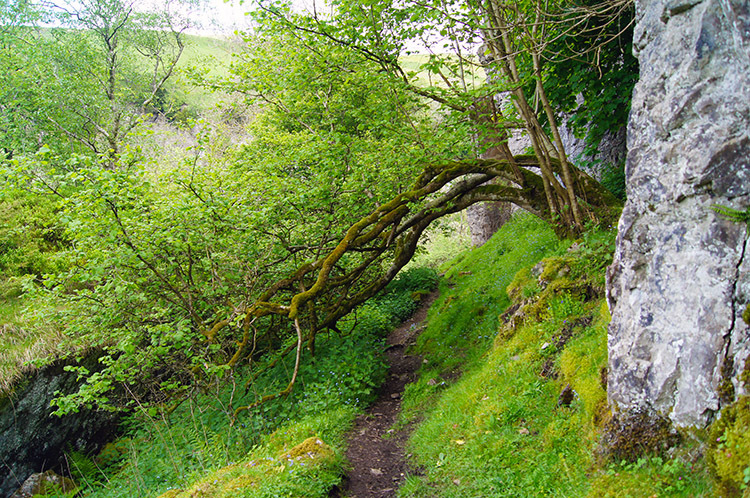 The path led us to Currack Force, a small waterfall taking water down from Stonesdale Moor to the Swale. after staying by the small accessible waterfall for a while we continued on to meet Stonesdale Lane. We could have followed Stonesdale Lane uphill and north onto the moor and continued for four miles to Tan Hill if we had wanted. 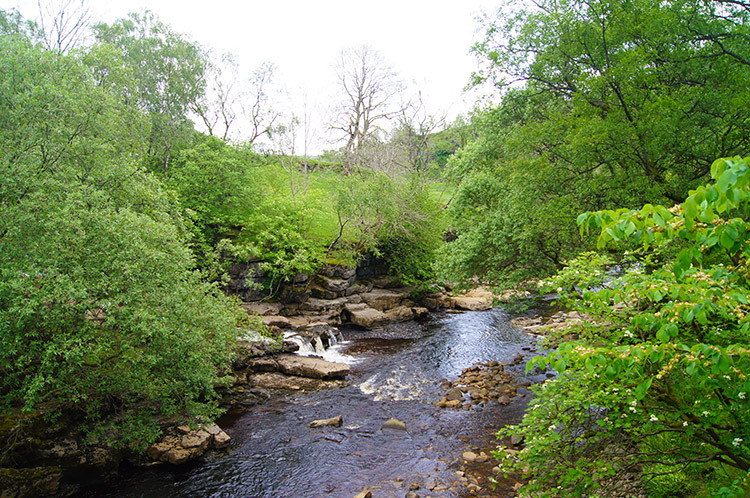 But we did not so we followed the road downhill to cross the River Swale at Park Bridge. On the bridge we looked west upstream the river to Cotterby Scar. 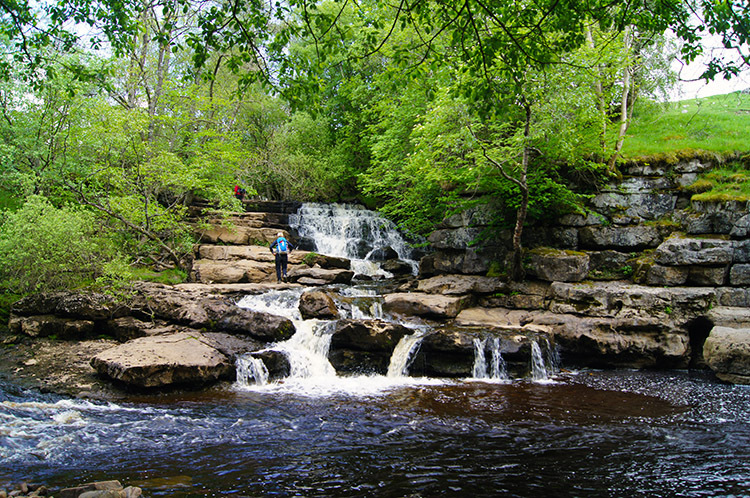 Another waterfall invited us on but we relented - we later visited it by car on our way to Birkdale Tarn. From the bridge we came to the B6270 which goes all the way through Swaledale. 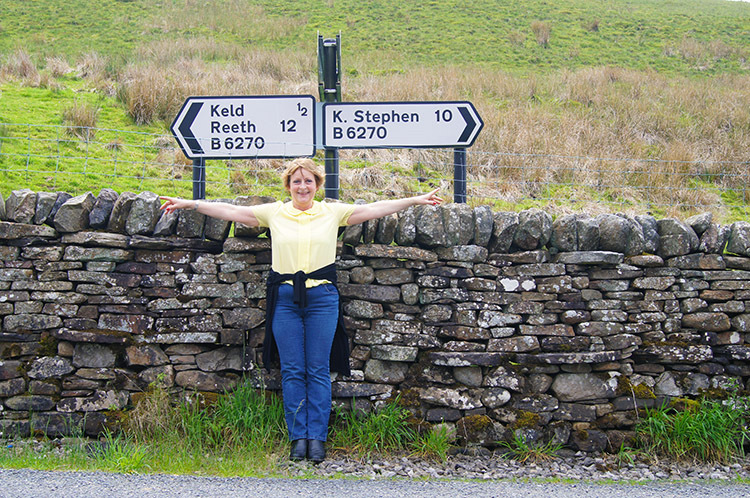 An iconic signpost sits at the junction, marking a halfway point on the Coast to Coast walk. I first stood there twenty years and one month ago on my first long distance walk. Lil pointed out the direction I took. She simultaneously pointed out the direction I took a second time. I have done the Coast to Coast in both directions. Back to todays walk and we were reaching the conclusion. From the Park Bridge junction on the B6270 we walked back into Keld and then after taking lunch at the lovely garden cafe beside the car park we walked down the farm track which led us to a riverside path taking us to Catrake Force. Lil was thrilled by this one, a bit more effort for her to get to than East Gill Waterfall and Currack Force and therefore a greater feeling of achievement. The setting, as with all the others, was a perfect picture. We dwelled by the last waterfall of our series on this great waterfall walk for some time before walking back to the car. Postscript: On our way home Lil told me what a lovely day she had out and what a wonderful walk she enjoyed. Perhaps not knowing what you are doing at breakfast makes it all the more enjoyable.